The sexually-charged and politically explosive scandal over a former Republican congressman's explicit e-mails to teenage boys has thrown party leaders and the White House into full-blown damage limitation mode. 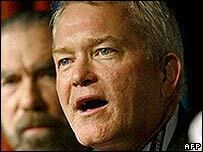 On Friday, five weeks before the US mid-term elections, Mark Foley resigned from his safe seat in Florida's West Palm Beach, after it emerged he had sent inappropriate messages to boys working as "pages" on Capitol Hill. What initially seemed a minor political embarrassment for President George W Bush's Republican party, has over the last few days become much worse. It has emerged that some of Mr Foley's behaviour was known about by senior Republican colleagues - including the party's leader in the House - for a number of months. They are arguing about how much they knew - and when. But the Democrats are demanding that the FBI - which has now launched an inquiry - determine whether Republican leaders tried to cover up Foley's actions for political reasons. Mr Foley, meanwhile, has checked himself into an alcoholism treatment centre where he says he will have therapy for "behavioural problems", in the latest twist to a case that has what some describe as the "eugh!" factor. It was only this July that the disgraced politician was pictured in the White House rose garden, shaking hands with President Bush at the signing of a bill protecting children from sexual predators. Mr Foley, 52, was co-chairman of the congressional caucus on missing and exploited children. Ironically, he could now face prosecution under a law that he helped to write as part of that committee. Across the country as a whole, local Republicans have been running a number of campaigns, accusing the Democrats of being out of step with "family values". Now they find themselves challenged on one of their core issues. This is not the kind of story that many American families will feel comfortable discussing over the breakfast table. Mr Foley's e-mails and instant messages - some discussing masturbation and other sexual matters - are reprinted on a number of mainstream media websites with disclaimers. As Ed Rollins, a Republican strategist, says: "These are issues that people understand. "They may not understand National Intelligence Estimates, they may not understand whether Bill Clinton did this, or George Bush did that [in the battle against al-Qaeda], but they understand when someone is sending perverted e-mails to young people." The big question is whether this scandal will cost Republicans votes they can ill afford to lose as they fight to keep control of the House and Senate. The response from the White House and party leaders has been swift in a bid to control the fallout. Since Friday there have been a flurry of press releases from senior Republicans, distancing themselves from the mess. 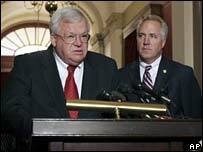 House Speaker Dennis Hastert said he was "outraged and disgusted" with Mr Foley's actions. Meanwhile, White House spokesman Tony Snow appeared on a clutch of Monday morning news programmes, describing it as "a terrible story". It was unfortunate that "people are thinking, 'OK, can I get political advantage out of this'," he said. Traditional political wisdom suggests that mid-term elections are fought and won by local candidates campaigning on local issues. But there is now a palpable sense of fear that the taint of sleaze may stick to Republican candidates across the US. Meanwhile, in Mr Foley's Florida constituency, there is an embarrassing footnote to the scandal: it may be too late to remove his name from the ballot paper.